Now even Justin Timberlake has been forced to deal with the question of whether a ballot selfie is legal. A Tennessee law that took effect earlier this year bars voters from taking photographs or video while they're inside a polling location. While secrecy in the voting booth has become a thing of the past for those ready to share their views and daily lives on social media, laws nationwide are mixed on whether voters are allowed to take pictures of themselves voting and their ballots. Tennessee Secretary of State spokesperson Adam Ghassemi said officials are "thrilled Justin can't stop the feeling" but reminded voters to use their phones inside polling locations only to help them vote. Timberlake lives in California, but grew up in the Memphis area and owns property near Nashville. How states handle the question. Connecticut: No law bans ballot selfies, according to Patrick Gallahue, a spokesperson for Secretary of State Denise Merrill. But election moderators have discretion to prohibit activity "that threatens the orderly process of voting or the privacy of another voter's ballot." District of Columbia: There's no ban. Election officials discourage people from taking pictures but won't do anything to stop them, said Tamara Robinson, a spokesperson for the D.C. Board of Elections. Kentucky: Secretary of State spokesperson Bradford Queen says state law does not allow people to record the likeness of a voter, but the law does not say whether voters can record their own likeness. Therefore, the secretary of state's office routinely tells county clerks the law does not prohibit ballot selfies. Michigan: A federal judge on Monday blocked enforcement of a ban on ballot selfies, saying it violates free speech. Lawyers for Secretary of State Ruth Johnson predicted "chaos" at polling places and asked the judge to consider freezing her order while they pursue an appeal in a higher court. Montana: Law does not specifically prohibit the use of cameras at polling places, but election administrators and judges have broad authority to limit disruptive activity, according to Emily Dean, spokesperson for the secretary of state. Sharing photos of absentee ballots is also not banned. Oregon: All voting is done through mail-in ballots, which voters are free to photograph. A state law prohibiting showing a marked ballot to another person was repealed in 2014, according to Molly Woon, a spokesperson for Secretary of State Jeanne Atkins. Vermont: No rules regarding photos in polling places. 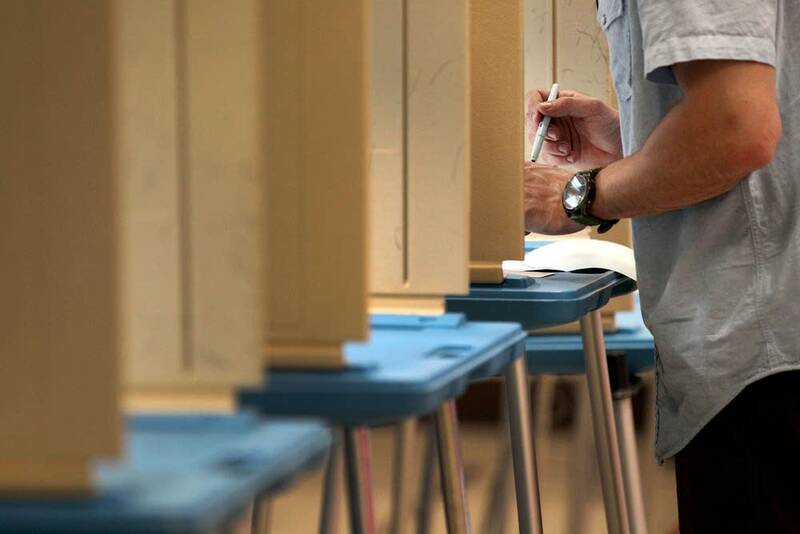 Clerks are encouraged to adopt specific rules for their polling places to maintain order, according to Jim Condos, a spokesperson for the secretary of state. Washington State: It's not against the law in Washington, but a spokesperson for Secretary of State Kim Wyman said the office doesn't recommend it. Alabama: Not allowed because voters have "a right to cast a ballot in secrecy and in private," said a spokesperson for Secretary of State John Merrill. Illinois: Banned by a law that considers "knowingly" marking your ballot so that another person can see it is a felony that carries a prison sentence of one to three years. Missouri: Law prohibits voters from allowing others to see their ballots if the intent is to show how they voted. Secretary of State spokesperson Stephanie Fleming described ballot selfies as a "gray area" and advises voters to check with local election authorities. Ohio: Has a longstanding prohibition against voters letting their ballot be seen with the "apparent intention" of letting it be known how they are about to vote. The state elections chief has advised local election boards to consult their own attorneys about how to apply the law. Two Republican lawmakers are sponsoring a bill they say will let voters photograph and make public their marked ballots. Tennessee: Voters are not allowed to take photos or videos while in polling places. They're only allowed to use electronic devices for informational purposes to assist during voting, according to Adam Ghassemi, a spokesperson for Secretary of State Tre Hargett. The state's law doesn't address mail-in ballots.